Nothing is as exciting as RV camping. If you haven’t tried it, then this it is time for you to try it out. While enjoying everything to do with the RV, there are basic things that you will need just like it is usually the case at home. One of these things is the washer dryer combo. A washer and dryer combination is a great tool and machine for your RV given the minimal space available in the motorhome. This is what you will need to wash and dry your clothes. Given its small size, it makes use of just a single tub or at most two tubs, also known as drum or cabinet. This article is a must-read for you regarding how to find the best RV washer and dryer. This is a compact and small washer and dryer that is so ideal for use in a recreational vehicle. It is lightweight and portable making it easy to move from the RV into your house in case you will not RV camping any sooner. It perfectly makes good use of the limited space in your RV due to its compact design. It is without a doubt the best RV washer dryer combo. To make it even more portable, it has been designed with rolling wheels at its bottom side, therefore, making it easier to transport. It has two tubs with one meant for washing and the other one is meant for spinning dry the clothes. The small size of this machine doesn’t in any way affect the washing tub’s space; it is still spacious enough. Given its spacious nature, the washing tub can store a good number of clothes that need to be washed. Its controls and features are simple and user-friendly which means you will spend the least time possible to have your clothes cleaned. This product has a washing capacity of about 7 to 9 pounds and a dryer capacity of 3.5 pounds. It also has a product spin speed and power of 1300 RPM and 120W respectively. This unit has a weight of 28 pounds. With its transparent lid, you can monitor how the cleaning happens. This washer and dryer combo needs a voltage of 110V at a frequency of 60 Hz to operate. It is accompanied with a 43-inch inlet hose and a 54-inch drain hose. But if the inlet hose isn’t matching with your tap, then use a bucket instead to directly fill the tub. The drain hose should be placed at a minimum height of 7 inches and at a maximum of 47 inches, but the best results are guaranteed when the drain hose is lowly placed. This product comes with a manufacturer warranty of 1 year. 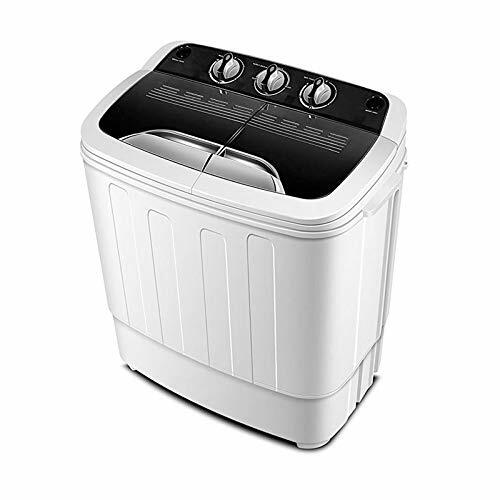 Do Mini Washing Machine and Spin Dryer is another great combo that can help you in an RV. It is a versatile machine with two tub construction. It is a great choice for a cramped RV space due to its lightweight and compactness. Due to its small size and lightweight (weighs just 29 pounds), it is easy to relocate whenever you need to. 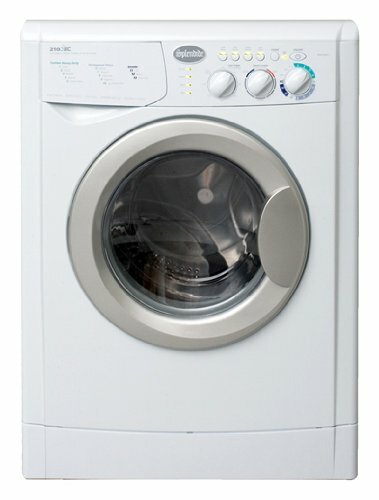 Its washer has a capacity of 8.3 pounds while the spin dryer has a capacity of 4.7 pounds. This makes its total load capacity stand at 13 pounds. These ratings are more than enough to take care of your daily laundry needs. Its dual function design ensures that the washing and drying take place simultaneously. This is why this product ranks high among the best RV washer and Dryer combos. What’s more, its handling process is very easy and convenient as a result of the outer and inner surfaces which are linear. Additionally, it produces a negligible amount of noise during its operation which means that you can even use it in the middle of the night without it causing distracting your sleep. This machine is easy to set up and has straightforward and user-friendly controls which make it easy to operate. One of the most conspicuous downsides of this product, however, is the fact that it doesn’t come with the water hose adapter which you will have to purchase separately. It operates at a frequency of 60 Hz with a voltage of 110V. This means that it draws power of up to 240 watts in the process of operation. This product is always available in a black color and is made of plastic. Here is Merax washer and dryer which is the least expensive of them all. Just like the other RV washers and dryers, this one is also compact, lightweight and portable. Its compact design ensures that it saves on space and this is something that is very important in RVs. It has been approved and verified by FCC to be safe for use. It doesn’t even require any assembling; you buy it and just subject it to use due to the fact that it is less complicated. For each load, you can set the washer timer to last up to 15 minutes with the spin cycle set at 5 minutes. The twin tub dual function design allows for simultaneous operation of which ends up saving you a lot of time by doing the washing and drying at the same time. This machine has a total capacity of 13 pounds which can be broken down to 8 pounds of the washer and 5 pounds of the spin cycle for drying. It has a speed of 1300 revolutions per minute (RPM) and operates at 110V/60 Hz voltage frequency. Its overall dimensions are 23 (length) by 13.5 (width) by 26 inches (height). What’s more, it weighs 24 pounds. The product is gray and white in color which gives it a very nice outlook. Its durable body is made of hard plastic. It is also worth noting that it operates quietly and its purchase includes attached hose and inlet for draining and adding water respectively as you wash.
Splendide WD2100XC from Westland is the most costly of them all but it is conveniently designed for use in mobile environments. It has an automatic load sense which helps in limiting the amount of water in the washer to match with what your load needs. This is one of the features for the increased price. The product is great for water conservation which is important because you might find yourself at a campsite without a stable source of water. It has an AC brushless motor that is capable of providing super silent operations as well as high performance in a small space. This product also has a stability regulator as well which is responsible for the quietness. Its 10 washing cycles and 3 dry cycles are very remarkable features considering its small size. It has a relatively wider door which makes it easy to fill with clothes. Its controls which are majorly electronic knobs are easy to use. Just choose a wash cycle, set the washer and dryer timer then press the start button. What’s more, it has a display that you can use to monitor the cycle status. It makes use of bidirectional rotation of the drum to minimize on fabric wrinkling while improving the whole process. It spins at a speed of 1200 RPM which makes cotton clothes dry at least 20% faster. It also automatically removes lint as a result of the self-cleaning filter that it comes with. The wash capacity of this product is 15 pounds plus an additional 11 pounds dry capacity. Besides, it has a dry time selector and some extra options such as low spin, water temperature, extra rinse and low heat. The more reasons it is suitable for RV travels are its heavy-duty springs, a durable drum made of stainless steel and shock absorbers. Its dimensions are 33.1 by 23.5 by 22.6 inches in length, width, and height respectively. It is, however, much heavier, weighing 145 pounds. It is the space available in the RV which will dictate the size of washer dryer to purchase. You first need to figure out the spot where you want to install your machine then take measurements of the space for guidance. You shouldn’t buy a larger-sized machine that won’t even fit in the available space. The washer and dryers are available in different sizes from which you can choose. You can’t miss a product that will perfectly fit into space at your disposal. On average, what is the number of clothes that you clean every moment you decide to do laundry? If there are 50 pieces of dirty clothes then you need to go for a fairly large washing machine. The washer should be able to accommodate the clothes that you would have done by hand or even taken to the nearby dry cleaner. A washer and dryer combo are usually compact in size which is the reason as to why you need to only do smaller loads as compared to the standard washers. However, the load shouldn’t be that small to the extent that you spend so much time cleaning just a few clothes. This is why you need to check the machine’s load capacity if it will be able to meet your needs. You can do this by factoring the average number of clothes that you clean every time you have to wash. This will help you determine the size and type of washer dryer combo to go for. Averagely, most RV dryers and washers can do about 8 to 15 pounds of load. The best washer and dryer should produce the least sound possible during its operation. The louder models are inconvenient to use especially during the nights when you need ample time to have a peaceful night sleep. And given that RVs don’t have larger spaces, you will end up being disturbed by the noise regardless of the distance between the machine and your bed space. A product that won’t even allow you to operate it while catching up with the latest news in your motorhome should not even feature in your list. Having just invested in an RV TV antenna just the other day, this will be quite a disappointment. The drum of the machine should be made of a heavy-duty long-lasting material. 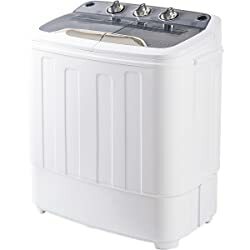 Whether it only has a single drum as is the case with most washer dryer combos or it makes use of multiple compartments, the durability of the drum should never be compromised. Some of the materials that can be used to make the drums are stainless material, plastic, and porcelain as they are also known for their convenience when it comes to the process of cleaning and drying clothes. However, drums made of stainless steel are usually the best since they are durable while at the same time they are capable of withstanding both hot and cold wash.
Can the washer and dryer save you water, energy, and money? These should be your priorities; otherwise, there should be no reason as to why you are buying the product. The RV washer and dryer’s efficiency and effectiveness are very important that you need to look into as well. If you can find an Energy Star rated product; the better for you. You need to conserve the little resources you have at your disposal whenever you are camping in the wilderness. Generally, machines with horizontally designed wash systems are usually the most efficient. Such machines do require the least amount of water and energy to operate. Are the settings and controls what you need to have in the machine? Are they user-friendly? Whether it has rotary controls, touchpad or touchscreen feature, the controls shouldn’t give you hard time to understand and operate. An automated machine is the best as you can go about other activities while your clothes are being washed and dried. Different fabrics require different washing environments; therefore, a washer and dryer with multiple wash cycles is very versatile and appropriate when it comes to meeting the daily washing demands. The different wash programs will make it easy to clean every fabric that you might come across. However, products with this feature are often the most costly in the market. But you only need to buy what you need and can afford. The vented technology usually uses the room air which is heated then tumbled through your clothes for drying. The exhaust air is then allowed to leave through a hole made in your motorhome and the machine is able to run longer periods without experiencing any challenges. In the non-vented technology, the air in the drum is heated. The heat is what collects moisture from your clothes before converting it into steam just within the drum. The process is then followed with condensation of the steam in a metal or plastic chamber by use of external cold water. The water is then drained from the machine into your RV’s water-holding tank. The non-vented technology isn’t preferred by many campers since the process takes longer to get the clothes dried beside the fact that it uses large amounts of water in the process. How portable is the machine? How many pounds does it weigh? These are some other important questions that you need to ask yourself before you buy an RV washer and dryer. The product should weigh just a considerable weight to make it easy to transport. There are some that come with wheels on their bottoms to make them easy to move around. Actually, there are instances where you won’t hit the road with your recreational vehicle and you can be forced to move the machine out for use in the house. This will be possible if the product is lightweight. There are some additional features that the product can have and they are very useful in the long run as well. Some of these are child locks to keep your children away from harm and also protect the machine from possible damage. There are also others with digital displays and automatic load sensors among other features you can come across. You also need to pay attention to these features as you go about looking for the best product. These combinations are the true definition of efficiency and convenience and are the most preferred by campers. With these, a single drum does both the washing and drying which means it takes the least space possible. However, their rate of water and power consumption is very high. These are mostly non-vented and usually get the job done in about 20 to 30 minutes. They need either electric power or elbow greasing to function. If you have the least space within your recreational vehicle then you can consider this type of RV washer and dryer. They are somehow similar to the types we use at homes. You can do up to 12 pounds of load every run. Using the washer and dryer of this type of RV washer dryer combo is easy and requires less effort and time to operationalize it. RV living and camping is very exciting but only up to when it hits you that you should be doing household chores here just as you do at the house. One of those chores that can consume most of your time is laundry work. You can end up not enjoying yourself to the maximum at the thought that you need to wash your clothes and have them fully dried up. 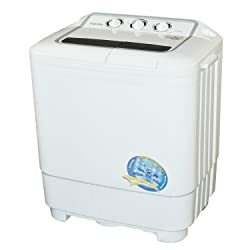 But thanks to technological advancements that have seen the production of the best RV washer and dryer in the name of Panda Washing Machine with Spin Dryer .It is reasonably affordable, easy to use, compact and lightweight. It is also portable which makes it a great machine for camping experiences. Besides, it won’t take up plenty of your space in the RV. You can give it a try and you will be amazed by how effective and efficient this product is. We hope you have learned something new by going through this article. Keep sharing your thoughts with us.